From the Temple of Sinawava, a mysterious name for the natural grand sandstone cliffs that dominated the landscape, we set forth. Passing overfed ground squirrels vying for our attention, we headed down to the Virgin river. Donning neoprene socks and waterproof boots, armed with stout ash hiking staffs, like Moses we entered the warm tranquil water. At this time of year it was a joy, but come winter, it would become a raging unstoppable torrent, cutting through the steep sided canyon. 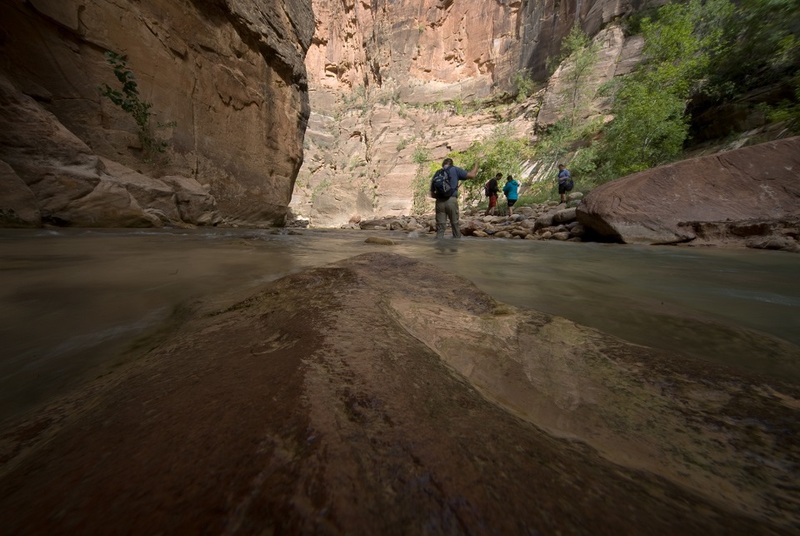 This was the Narrows, a world famous hike, and justly so. Negotiating upturned trees, testament to the sheer power of nature, we meandered with the water which was up to our waists in places. The steep walls of the canyon, a thousand feet high, and the river, twenty to thirty feet wide, combined to create a world like no other. Passing waterfalls and people more energetic than us who were abseiling down sheer sandstone faces. At Wall Street the canyon walls narrow until they nearly meet. Oranges,reds, sun and shadows converge, trees and bushes high overhead maintain their precarious existence. The one item I couldn't do without: Trailblazer trousers, they certainly did. The one item I wished I brought, but didn't: More memory for the camera. The one not so good thing: Camping in tents; I like a little bit of luxury these days. Highlight: The Narrows, I urge everybody to do it.